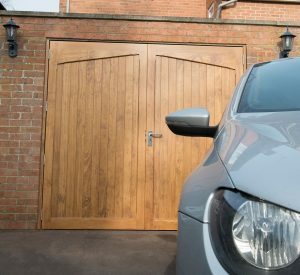 Side hinged doors are becoming increasingly popular again as fewer people are garaging their cars these days. Traditionally, side hinged doors were only available in classic timber designs. However, today there are a lot more choice in both designs and materials used for construction; we still have the traditional timber designs available in quality timbers like Western Red Cedar, Accoya and Idigbo (a hardwood very similar in appearance to Oak), but also have now many single and double skinned steel designs. For those of you wanting high levels of insulation we offer a wide range of double skinned foam filled hinged doorsets in a massive range of painted or woodgrain laminate finishes, all purpose made for a perfect fit. Matching pedestrian side doors are also available for these door designs and finishes. For the wider range of timber doors now available, these can be supplied base-coated ready for onsite staining or factory stained in a range of colour shades. Alternatively, if you would like to have the doors finished in a paint finish you have two options – the factory can prepare the doors in a primer suitable for onsite decoration or alternatively factory paint the doors in an RAL or BS colour of your choosing. Accoya is then worth a look, as a factory finish Accoya door carries a 10 year warranty on the finish, previously unheard of for timber products with none of the problems of “bleeding through” associated with Western Red Cedar. Accoya is more expensive than traditional timber species but the longevity and stability Accoya will more than make up for the associated cost and provide doors that last. Accoya® is a new type of timber that Woodrite Doors have introduced in the form of the Thetford range. Accoya® uses a “super-technology” treatment process that acetylates the wood making it incredibly stable and able to outperform most hardwoods. The timber used is sustainably sourced Radiata Pine. It makes a beautiful base for staining that is so inert we can offer a ten-year warranty on finish – unheard of for a timber garage door! It’s perfect for painting too, with no tannins or resins to leach through. There are lots of designs to choose from in timber, plywood with solid timber detailing, solid timber vertical tongue and groove or raised and fielded panels. All of these construction methods are available with and without glazing. 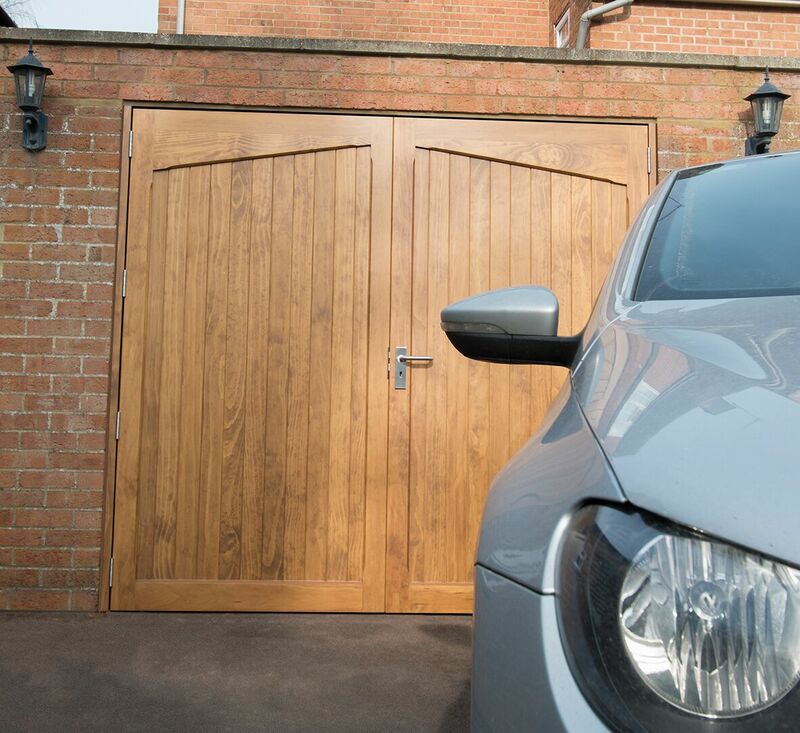 If you are after the natural solid feel a high quality pair of timber side hinged doors are hard to beat and The Garage Door Centre has the widest range anywhere in the UK. Samson Doors offer many types of specialist garage doors and front entrance doors, and we have several with tested security ratings for the now often required ‘secured by design’ rating. Relatively new still to the UK this is, in theory the answer to many peoples problems in one garage door type giving all the benefits required. It is like many things you buy: you have cheap, moderate, and high-end product quality, but with roller doors it seems a lot more difficult to judge what is really going on. When should you install the garage door in-between the garage opening and when should it be behind? How does a garage door lock when fitted with an electric opener? There are various ways a garage door will lock with an electric operator fitted but it depends on the door and of course the operator…. In answer to this question Hormann think it should be as insulated as is physically possible. We have discussed this topic now for so many years and yet the answer is still the same today, when it comes to needing a standard steel up and over garage door in a standard UK size there is only one choice still.